In 2005, a total of eight new stallions and 9 new mares joined the SPSS studbook. The mare Sapphire Blue was awarded ELITE status in recognition of her outstanding competition record. Heart of England Equestrian Centre (23rd October 2005) by kind permission of the Ballantyne family. In foal to Mill Law. Extensive competition record – of which these are only some of the highlights! Sharron should have been ridden by owner's daughter, but she sadly fractured her foot earlier this month. She got to JC with previous owner and has won a JO class with current rider as well as doing Pony Club activities, local showing and showjumping. Sire is now a SPSS stallion. Wurligig was placed 3rd in the fillies age 1 to 3 years likely to make a dressage pony class at the 2005 BD Breed Show – behind her younger sister and half sister both also sired by Sheepcote Wurlitzer - a very impressive result for him. Wurligig was also placed at the 2004 BD Breed Show. In foal to Thursden Vallye Raphael (a son of SPSS stallion Aimbry Chester). Strong bloodlines of the famous stallions Downland Chevalier, Keston Royal Occasion and Rotherwood State Occasion. Shown once as 3 year old and qualified for PUK – but did not attend due to owner's personal circumstances. Has had 2 previous foals – her 2 year old colt was placed 3rd in the colts age 1 to 3 years likely to make a dressage pony class at the 2005 BD Breed Show. Also has a yearling foal by the stallion Thistledown Copper Lustre who licensed as a stallion at the same Grading. A Grade JC showjumper, Matcho has exceptional German bloodlines and is an exciting addition to the stallion list. His Damsire, Power Boy, is also the sire of the 2004 European Dressage Pony Individual Gold and Team Silver Medallist, Power and Paint. 2005 has been his first competitive season and he has won and been placed at novice/elementary dressage, showjumping, M&M Working Hunter Pony and Ridden classes (where he has won one championship and 4 reserve championships). Recently 7th out of over 100 horses in a Hunter Trials. Graded this summer by New Forest Pony Breeding Society at 2'9” showjumping and Prelim & Novice dressage. Sire, Fleetwater Olympus is a Trakehner, Dam was Anglo Arab, so is 25% Arab. Before being injured competed at Pre-Novice and Novice eventing and won money as a Grade C showjumper. His son Olympus Hale Bop stands at stud as well as competing at Affiliated Elementary dressage. Although lightly competed, is jumping BSJA Grade C, with double clears at British Novice and Discovery. Also won Small Hunter class at National Hunter Show this year. On Weatherby's Non TB register and has a handful of progeny out of a broad selection of mares ranging from traditional cob to TB/ID cross. Has Downland Chevalier & Paddock Camargue bloodlines. 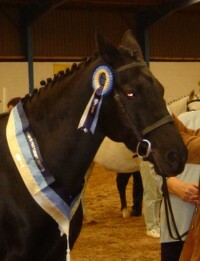 Successfully shown in hand up to 3 year old – won and highly paced at county level. Broken to ride this summer, aiming at a dressage career. He has scored over 70% at unaffiliated Novice level.